From Popfun Merchandise. Love� mad love! Well, what did you expect from the Clown Prince of Crime and his main squeeze? 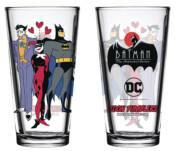 The Joker, Harley Quinn, and Batman appear in the amusing artwork surrounding this brightly hued Batman: The Animated Series Mad Love Toon Tumbler Pint Glass that also displays the TV show's logo.